(1991/LINE) 20 tracks with 20 page booklet. last copies! 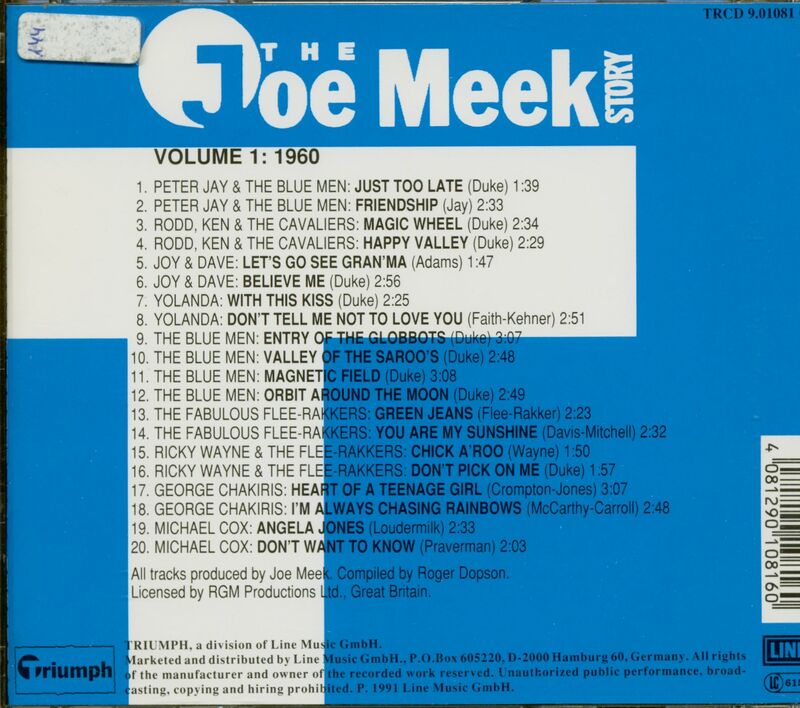 Meek came from Gloucester and did his National Service in the RAF as a radio technician in the early Fifties. In 1953, he came out and went to work as an engineer at the IBC studio, at that time one of only two independent studios in London. 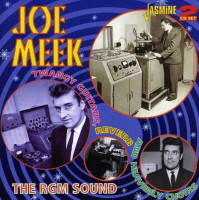 There he engineered records by Frankie Vaughan (`Green Door'), Denis Lotis, Lita Roza, Shirley Bassey, Anne Shelton, Harry Secombe and Petula Clark. 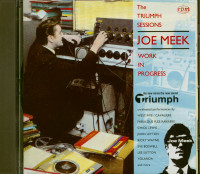 In 1956, Meek went to work for Denis Preston at Lans-downe Studios, where he was engineer on several of Lonnie Donegan's early hits, including 'Cumberland Gap' and `Don't You Rock Me Daddy-O' as well as trad jazz records by Humphrey Lyttelton and Chris Barber. He also began dabbling in songwriting and in 1958 wrote Tommy Steele's Tut A Ring On Her Finger'. 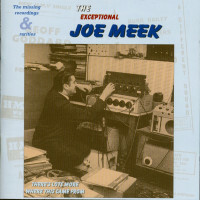 Leaving Lansdowne in 1960, Meek built his own studio in a flat above a shop in Holloway, North London, equipping it with £3,000 worth of second-hand equipment. He called it RGM Sound and simultaneously activated his own label, Triumph, going against all odds at a time when British pop was monopolized by the three major labels. 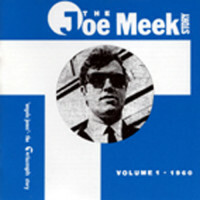 A cover version of an American hit, 'Angela Jones' by Michael Cox, reached the Top Ten in June, 1960 but none of Triumph's other releases were successful and Meek discontinued the label in favour of tape-lease deals with the majors. 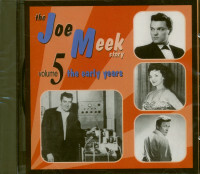 He scored the following year with John Leyton's eerie, futuristic 'Johnny Remember Me' and 'Wild Wind', Mike Berry's poignant `Tribute to Buddy Holly' and several smaller hits by the Outlaws (with Richie Blackmore) who backed many of Meek's artists on record. 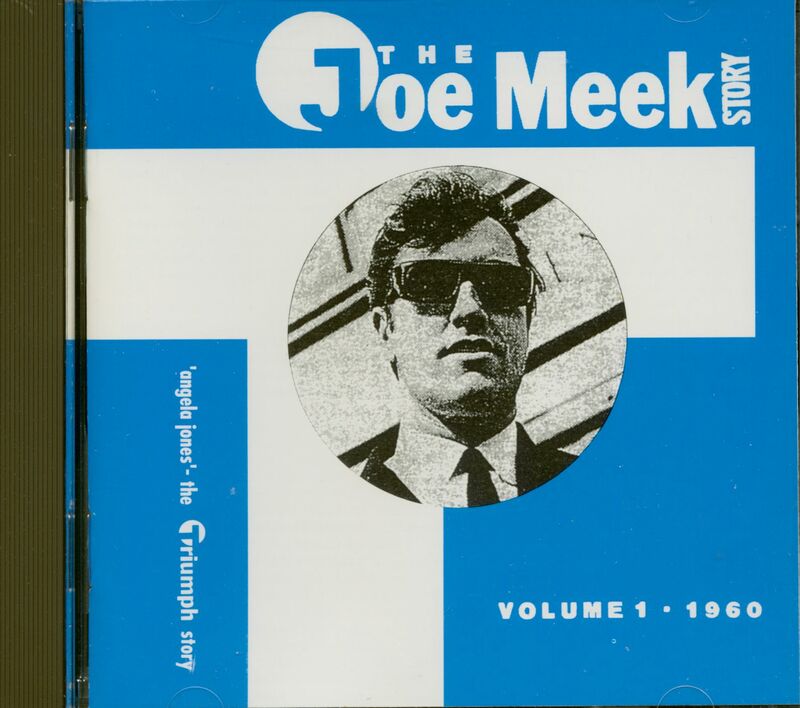 In 1962, a combination of Meek's session musicians recor-ded an instrumental he wrote titled `Te!star', under the name of the Tornados, which proved his biggest selling hit, reach-ing No. 1 in both Britain and America. In production terms, it still remains far ahead of contemporary records. The Tor-nados followed up with several slightly less successful records including 'Robot', 'Globetrotter' and 'Ice Cream Man' be-fore being swamped in the ensuing Merseybeat craze. Never-theless, Meek scored early in 1963 with Mike Berry's 'Don't You Think It's Time' and in 1964 with the Honeycomb's `Have I The Right', but found the going hard in the mid-Sixties. He had no hits in 1966 and faced with increasing anxiety through personal problems, blew his brains out with a shotgun on February 3, 1967. Customer evaluation for "Story Vol.1 (CD)"